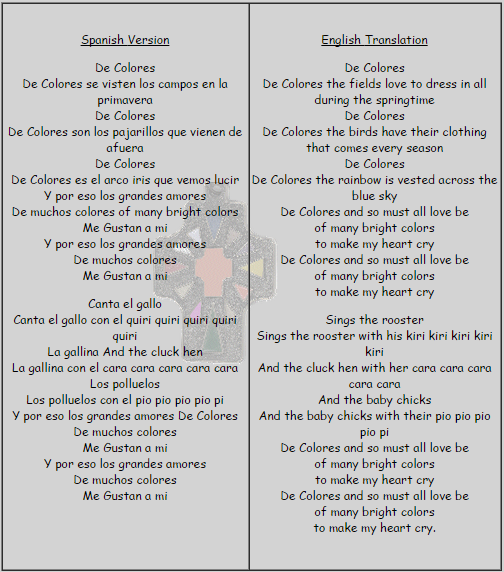 "De Colores" (literally, "Of Colors") is a traditional folk-song that is well known throughout the Spanish-speaking world. The song was brought to the Americas from Spain during the 16th century. In modern times, the song frequently appears in collections of childrens songs. It is widely used in the Cursillo movement and related communities such as "DeColores" and "Walk to Emmaus". The words of the song are an expression of joy and a celebration of all creation with its many bright colors. There was a group of Cursillistas (those who have attended a Cursillo Weekend) in Spain riding home on a bus, singing and rejoicing, when the weather turned for the worse. A frightening storm with lightening and thunder had them huddling together in the bus on the side of the road, and even halted their singing. But when the storm was over, the clouds parted and the sun peeked through. As the tension lessened, one Cursillista looked out the window at the farm they had parked in front of; and there saw a rooster, resplendent in color in the sparkling aftermath of the storm.